LONDON, UK – 27 September 2017: HUMAX, the UK’s leading provider of digital set-top boxes, has introduced its easiest-to-use Freeview Play Recorder yet with the launch of the FVP-5000T. Simple to install and set up, this new HD TV recorder includes integrated Wi-Fi connectivity, delivering an extensive range of catch up and on demand content services. This is in addition to 85 subscription-free TV channels (15 in HD) and more than 25 digital radio stations, enabling viewers to choose from a huge variety of drama, music, entertainment, movies, news, sport, children’s shows, documentaries, box sets and more. Catering for even the most avid of viewers, the FVP-5000T is the only Freeview Play Recorder to incorporate three digital tuners, allowing up to four programmes to be recorded at once while the user watches another live channel**, making it the most versatile model in its category. Three hard drive options (500GB, 1TB and 2TB) are available, enabling up to 250, 500 or 1,000 hours of recordings to be stored, giving owners almost unlimited capacity to capture their favourite programmes, series and movies. Prices start from £229. With a faster, slicker interface than its predecessor, the FVP-5000T incorporates a new intelligent Smart Search feature designed by HUMAX, making it simple for owners to locate their favourite shows from live TV, recordings, Freeview Play apps and catch up TV. It also intuitively discovers and selects content from streamed VOD services such as YouTube. Furthermore, HUMAX has developed its own ‘Top Picks’ TV recommendation service. Within this menu, the most popular On Now (live), On Demand, Recordings and Freeview Play content can be selected by genre. Series or regular programmes with multiple episodes are displayed with dates into the future, so the user can immediately see how long the entire series will run. An intuitive eight-day electronic programme guide (EPG) allows viewers to select, plan, remind and record, meaning they’ll never miss their favourite shows again. It also includes seven days’ catch up from within the guide. For even further flexibility, viewers can pause and rewind live television. 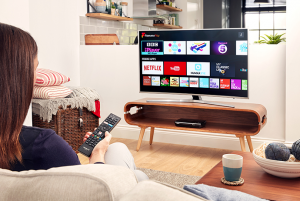 Thanks to the integrated Wi-Fi connectivity, the FVP-5000T provides access to hundreds of catch up TV and on demand shows and movies via BBC iPlayer, ITV Hub, All4, Demand 5 and UKTV Play, plus optional paid networks and services. With its sleek and compact ‘carbon fibre’-style design, the FVP-5000T will complement any home cinema set-up. The accompanying remote control is exceptionally easy to use, with three prominent ‘hot keys’: a Freeview Play button for direct access to TV Guide, Players, Top Picks, Recordings, Media, Settings, Catch up and apps from one single screen; an On Demand button taking the viewer straight to the On Demand area of the HUMAX Top Picks service, where On Demand content is recommended by Freeview Play; and a third dedicated button provides direct access to Netflix*, the world’s leading internet entertainment service. Giving the user complete visibility and quick access to channels, the FVP-5000T includes a Surf & Scan Banner. When watching Live TV, the viewer can press the ‘OK’ button on the remote to display a banner at the bottom of the screen showing the current programme information. With a press of the surrounding arrows, the user can then scroll up, down, left or right on the banner to see details of content from other channels. Another press of the OK button displays a full screen with detailed programme information. This then provides the option to record the programme or series, or set a reminder to watch later on catch up. Alternatively, when watching Live TV, the user can press the up or down arrows to display a channel list on the left hand side of the screen, as well as a thumbnail and title of the current live programme. Here, the user can scroll up or down and press OK to tune straight into a new channel. Adding even more options for entertainment on the ‘big screen’, the HUMAX FVP-5000T enables users to enjoy photos, videos and music from connected devices on their home network – such as smartphones, tablets or laptops, or directly from a USB stick – on an HD television via the Media tab from the Freeview Play Home screen. File formats supported include XviD, h.264, MP3 and JPEG. When paired with the HUMAX FVP-5000T, the all new HUMAX Live TV App allows the user to control and plan their TV viewing while away from home directly from a smartphone or tablet. When used in the home, the app will allow content and live TV from the box to be streamed to the connected device. It also transforms the mobile device into a remote control for the set-top box. For owners of the HUMAX EYE HD Cloud Camera, live or recorded footage from the home security monitoring camera can be watched on a TV set via the FVP-5000T, through the dedicated, built-in HUMAX EYE app. The FVP-5000T can also be paired with the HUMAX H3 Smart Media Player as a ‘buddy box’, for multi-room TV with no subscriptions or fees. More information on the HUMAX FVP-5000T can be found at www.humaxdigital.com/uk. Visit www.freeview.co.uk for a full list of Freeview Play channels and services. Available from the second week of October 2017, the Humax FVP-5000T has a suggested retail price of £229 for the 500GB model, £259 for the 1TB model and £299 for the 2TB model. Retailers include John Lewis, Currys, Argos, Amazon, Richer Sounds, Maplin, Hughes, Tesco, Euronics (CIH), AO.com, independent electrical stores and Humax Direct. Prices include VAT.